In Mid April I sent all subscribers an email letting them know about a new in-play service we were testing. Members can read all about it here. The first live bets were sent on the 22nd of April and this post will cover all bets placed from day 1 until the 26th of June 2016. A period of just over 2 months. The predictions will continue to be free until the end of this AFL season. Depending on whether in-play betting is still legal in 2017, the service will be for a small group of paying members. We advised a bank of between 80-100 units for this service and over the season we were looking for a 100% return on capital. The bets were to be from 1 to 5 units. So how have we done in the first two months of live bets? pretty damn well. We have advised a total of 656 units over 166 bets, an average betsize of 3.95 units. 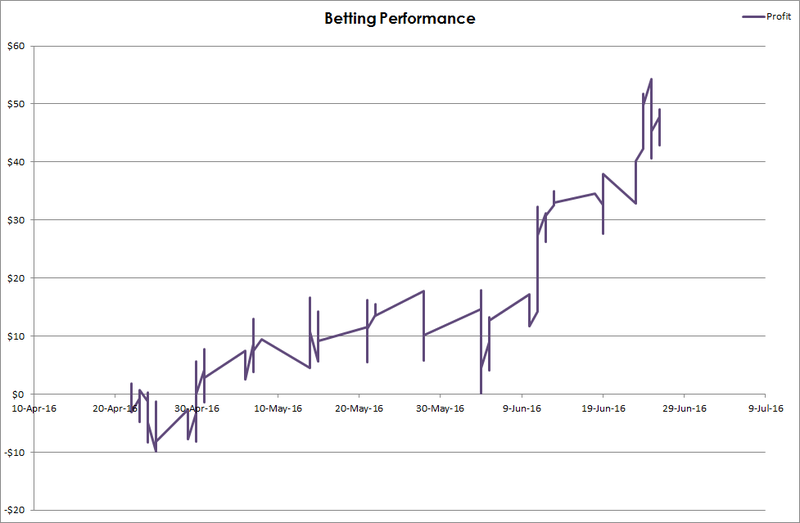 We have won 54.8% of the bets and made a profit of 49.11 units. That’s a ROC of 50% and an ROI of 7.49%. While most of the plays are middles, over 39% of the profits are from straight out bets. It is also good to see that the half time bets produced 55.61 units profit at a 13.76% ROI, which means just following these bets could be the most profitable for the lowest amount of effort. Middling is a betting strategy that is low risk/high reward. During a live game, odds fluctuate widely. The bookmakers all have different algorithms that determine what the odds should be at any point during a game. This is where our advantage lies. At many times throughout a game, different bookmakers have very different lines. Let’s cherry pick a real example from our results. We will be looking at the Geelong v North Melbourne game played on the 11th of June and be looking at the total points market (the combined total that both teams will score). At half time William Hill had the under 180.5 at odds of $2.10 and Bet365 had the over 176.5 at $1.95. We advised 5 units on each total line. Here are the possible outcomes. Total is between 176.5 and 180.5: Win both the U 180.5 bet (+5.5 units) AND the O 176.5 bet (+4.75 units) for a total profit of 10.25 units. The majority of the time we will take a small loss or small profit. But there is always the chance of “hitting the middle” and winning both bets. In this case the game ended with a total of 179 points and members won 10.25 units. In-Play is illegal in Australia right? The government has made it clear that in-play betting over the internet is illegal and the bookmakers still continue to offer this service. Eventually it will be shut down and the only way to place the bets will be through a real phone call. We will be keeping an eye on the market and I’m positive the bookies will be doing everything in their power to make it legal for the next AFL season. If you’re a current member, you can follow this link and start receiving real time updates to your desktop computer or android phone right now. Like anything new it takes a bit of time to get used to and does require you to get on very quickly. I’d suggest minimum stakes while you learn this new skill and see if it will fit in with your lifestyle. Once we go live in 2017 we believe it will require about 4-5 hours of “work” per week. 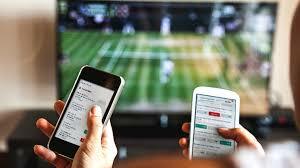 By work we mean being close to your phone during games and ready to bet at a moments notice. The software we are currently using to send notifications does have a number of bugs, but it does work well. If this service is to go to a paid one then investment will be made in an app for both Iphone and android. If you are not a current member and want these plays, I would suggest signing up to our Value and Risk free service. This will give you access to the in play bets but also to our Value service which continues to make huge profits from bookmaker promotions. At Dailyprofit we continue to use maths and low risk / high reward strategies to make you a betting profit. Visit the homepage and sign up now.